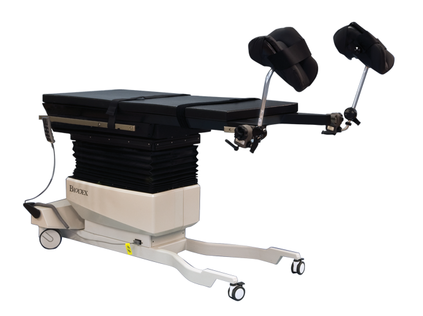 Designed and equipped for use with 3D C-Arm for seed implantation, urology, thoracic/vascular and other general C-Arm applications. The narrow, low-attenuation carbon fiber tabletop is cantilevered to accommodate portable 3D C-Arms. 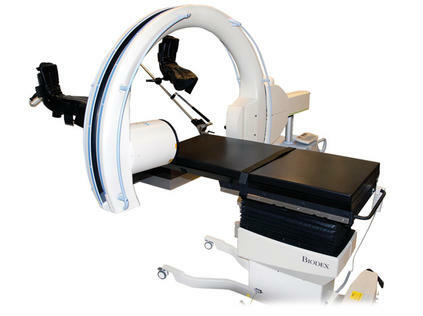 The functional design provides complete access with minimal radiation exposure to clinicians. The table features motorized actuation of height, X-Y, lateral roll and Trendelenburg motions of the tabletop. 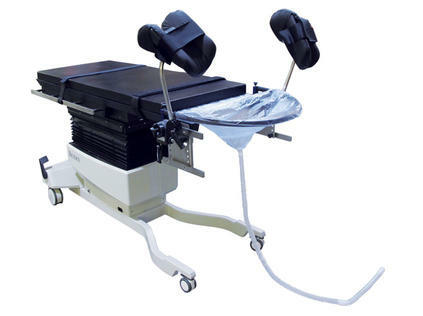 The hand-held and foot-operated controllers can be positioned for access from any point around the table and ensure quick and safe tabletop positioning during any phase of a procedure. The "Level" feature returns the table to 0° tilt and 0° lateral roll, bringing the table quickly to a level position. Both controllers can be used for motorized X-Y positioning of the tabletop and feature proportional speed control. 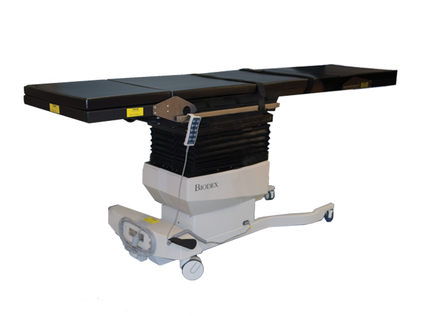 The table comes equipped with a lightweight, non-imaging patient transfer extension and a radiolucent extension. A standard OR accessory rail located at the foot end of the table makes stepper positioning quick and easy. Select from knee crutches or the PAL Stirrups, standard or Dura Board arm boards, the choice is yours…configure to your exact specifications. Both AC and battery power are standard. When operating on battery, there are no power cords to hinder movement or block casters. Battery charging can be accomplished during off hours by plugging in the AC adapter cord. An optional battery with separate charging unit can provide continuous cordless operation. Radiolucent Area – total length, 51.5"
The portable hand-held and foot-operated controllers offer the freedom to adjust height, lateral roll, X-Y and Trendelenburg motions from positions away from the table, or when hands are busy with other functions. The hand-held controller hangs on the accessory rail when not in use.